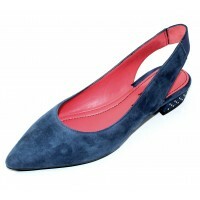 Slingback with elastic insert. Leather linings and leather padded insole. Rubber sole. 1 inch heel with studs. Made in Italy. Slingback with elastic insert. Leather linings and leather padded insole. Rubber sole. 1 inch he..